A community growing project starting with the renovation of the Rose Walk (the gated path running from Plymouth Road to the Meadows between the tennis courts and the bowling club); and as funding allows securing a greenhouse and resources to grow our own!. For latest news check out our Facebook page. 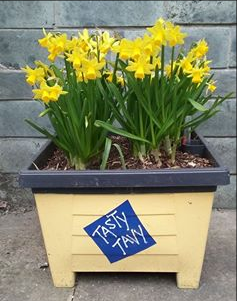 A suitable site was spotted in a nice sunny spot in town so Tasty Tavy approached Tavistock Town Council and asked permission, and this was granted. So we now have the makings of a pop-up vegetable plot! It is a little late in the season for starting fresh seeds so we are relying on plug plants ( for those without a greenhouse this is a very good way of creating a plot, plus you are supporting the local growers). The plot will be planted based on the square metre gardening approach regarding spacing so we should almost be able to provide a family of four with a good portion of their greens. We have also have some wonderful sponsors in the form of Abode, they are being most supportive. Please keep checking progress, the bed and planting wall are not far from the Library just over the canal in the cobbled area behind the Wharf. Volunteers …… are always welcome to join our ‘growing’ team! If you can spare a few hours (enthusiasm is the only requirement!) please contact us on 01822 820345 or email Sue. Full details of this and other activities are on our facebook page Roots to Transition. The Rose Walk is being spruced up and made ready for the new season with bee friendly flower beds starting as soon as possible along the canal. Orchard area is being developed, supported by Endsleigh Gardens Nursery (Milton Abbot) who has donated some apple trees. Sensory Garden and a Community Garden next to the Rose Walk. We’re hoping to start in Autumn subject to funding. Volunteers are always welcome to join our ‘growing’ team!